A UWIC graduate based in North Wales. 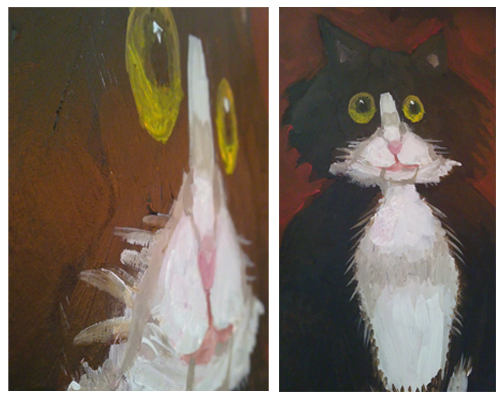 This is a portrait of her grandfather's cat Sidan (welsh for silk because her fur was so soft) painted from memory. She use acrylics, acrylic mediums and poster paint on board. The first layer of paint is her ground made from poster paint and acrylic to make a very matt finish. Then the portrait is painted with acrylics and mediums for a glossy finish to create a contrast in the texture.